VT SuN prepares graduate and undergraduate students for careers as global leaders in sustainable nanotechnologies. We accomplish this through interdisciplinary curricula integrating nanoscience with core disciplines in the natural sciences and engineering, intensive laboratory and field research, and hands on training with advanced nanoscale characterization and fabrication instrumentation. University degree programs related to VTSuN are located in the VT College of Engineering and the VT College of Science. VTSuN is an IGEP (Interdisciplinary Graduate Education Program), a special graduate degree established by the VT Graduate School. Students gain skills in developing and applying nanotechnology in a sustainable context, in terms of the full life cycle of development, use, and disposal of materials, and for application in areas of most pressing environmental need. To prepare future leaders in academia, industry, or government agencies that interface with nanotechnology in its research, development, and application, considerate of potential impacts to human and environmental health. Our goal is to develop sustainability considerations to keep pace with the rapid development of the field of nanotechnology. What happens to nanoparticles once they are used and disposed of? Where do they go in water, air, and soil? How do they impact the efficacy of waste treatment processes and what kinds of unintended by-products may be formed? What are the inputs, outputs, and environmental impacts of nanoparticle production, use, and disposal? What metrics should be used to define a “green” nanomaterial or nanoprocessing method? What are the impacts of nanoparticles on aquatic species and microbial communities? How are nanoparticles taken up or transformed in a biological host? How can nanotechnology be harnessed to enable more sensitive, robust, and economical detection of pathogens in the environment and help address public health and water sustainability goals? How can we apply nanotechnology in environmentally sustainable solutions for air, water, and wastewater treatment. Check out the IGEP blog! Virginia Tech has a brand new interdisciplinary Bachelor of Science degree in Nanoscience. The program is part of the College of Science's Integrated Sience Curriculum. VTSuN faculy are involved in this program by team-teaching COS 2984 Introduction to Nanoscience I & II, a two-semester course for undergraduate students, and by hosting the nanoscience majors in laboratory rotations in VTSuN research labs. VTSuN is proud to host undergraduate students from Virginia Tech's Scieneering program and the Center for the Environmental Implications of Nanotechnology (CEINT) for summer research experiences. High School Education: Welcome do Nanoscience! Nanoscience helps biology, chemistry, and Earth and environmental science teachers at the secondary level introduce this revolutionary science and technology to their curriculum. What do wrinkle-resistant pants, iPads, and sunscreen all have in common? Nanoscale science and technology, of course. 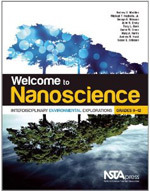 Welcome to Nanoscience helps biology, chemistry, and Earth and environmental science teachers at the secondary level introduce this revolutionary science and technology to their curriculum. The authors begin with historical background, include tips for how to use the book, and tie lessons to National Science Education Standards. The book provides a unique framework for the study of nanoscience through environmental science, specifically groundwater pollution. Each classroom-tested, inquiry-based investigation follows the BSCS 5E Instructional Model and includes step-by-step instructions, materials lists, and data charts. Teachers may choose to use individual lessons or adopt the book in its entirety. For more information about Welcome to Nanoscience, contact Michael Hochella, hochella@vt.edu or (540) 231-6227.